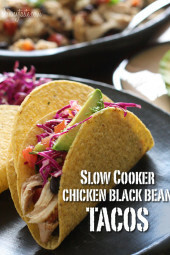 This easy taco recipe requires no pre-cooking, just throw it all in the crock pot and you’ll have a delicious weeknight meal. 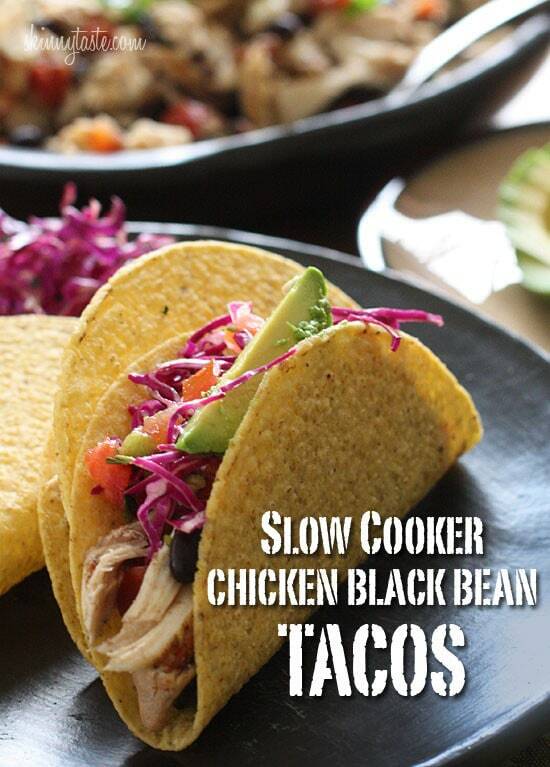 Black beans and chicken breast, simmered in the slow cooker make the perfect filling for tacos, burritos, enchiladas, or even a burrito bowl and it’s loaded with fiber. Personally, I love this served in crunchy corn taco shells. I make a quick red cabbage slaw which adds a little acidity and crunch, and it’s a healthier option than iceberg. Add some spicy pico de gallo for freshness and avocados, and I am one happy gal! So good you won’t even miss the cheese! I often make my own pico de gallo, but when I’m pressed for time, I have no problem buying it. There are lots of great options in the refrigerated produce section of the supermarket, Nature’s Promise is usually my go-to, is organic and has just the right amount of kick. Avocado is so good on tacos, and loaded with heart healthy fats. It’s creamy and delicious and I totally skip the sour cream, but if you rather save on calories and leave it out, fat free Greek yogurt works fine in it’s place. Season chicken with pinch of salt, garlic powder, oregano, 1/8 tsp of the chili powder and 1/8th tsp cumin. Add the beans and tomatoes to the crock pot and season with the remaining chili powder and cumin. Place chicken in the crock pot and cover. Cook on HIGH 2 hours. Meanwhile, combine shredded cabbage with vinegar (add more to taste), season with salt to taste; set aside. Remove chicken from the crock pot and shred with two forks. Drain beans and transfer to a platter, or back to the crock pot to keep warm. Top with shredded chicken, scallions and cilantro. To serve, warm the taco shells according to package directions. 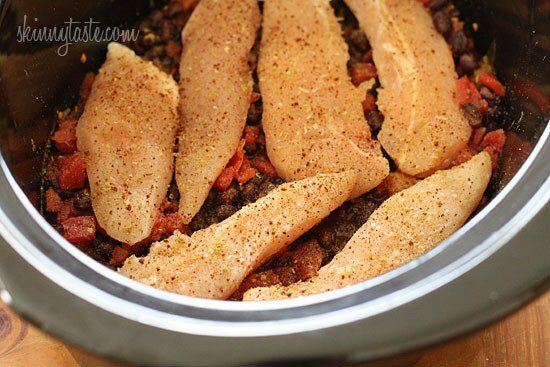 Fill with equal amounts of bean and chicken mixture. Top with cabbage and your favorite toppings. Just browsing the website for things I never made before and decided to try this today. Not disappointed!Great tasting and so easy. Topped with the slaw, pico, and avocado as suggested. The envy of everyone at lunch. Bringing it again on Fri. Definitely on the repeat list! A hit with everyone! I love when that happens! Made these for lunch today. They are very quick to make. I probably should have weighed the chicken before adding to the pot as I think I used much more than 12 oz. I will make again and next time weigh the chicken. Thanks for a delicious taco lunch. Thank you for this recipe. I made what I am calling double black bean nachos using this recipe. I used black bean chips with sour cream and guacamole on top and have eaten it three times now! I look forward to trying your other recipes. Can this be done in the Instant Pot? How long would the chicken need to cook? Do you know what this would be in Freestyle points?? Does the smart points value include the shells? Thank you! How much is chicken with rice and tomatoes with no shells for weight watchers? Hi! 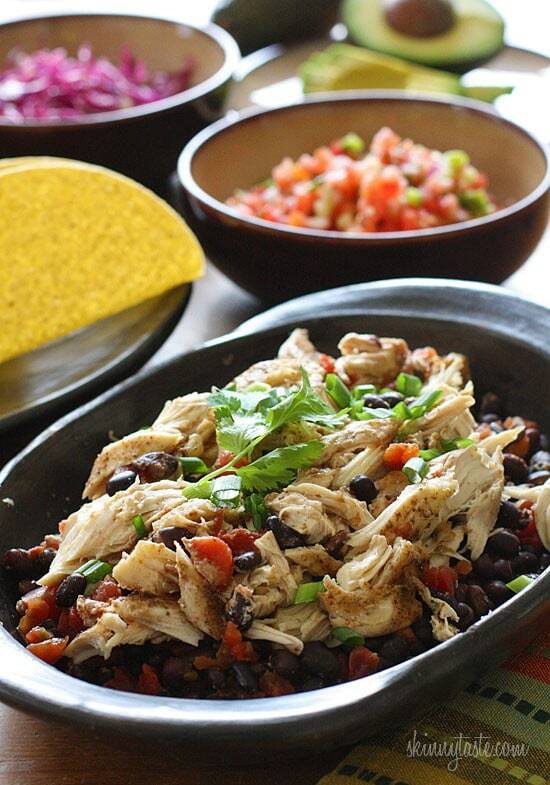 Could I use the chicken part of this recipe minus the black beans for shredded chicken on a burrito bar? I also thought of the shredded chicken recipe that is for your enchiladas. Let me know if you have any suggestions. We love Skinnytaste, Thank you!! Yes and I think either one will work. Amazing as always! I could only eat two. My 14 year old glommed it! I am down 20lbs in 10 months thanks to your recipes. My entire family loves them! What did you mean when you said to drain the beans after the cooking was complete? They are in with the tomatoes so I’m not certain how you would do that. Looking forward to trying this recipe! Discard excess liquid so it’s not watery. Not good for your taco shells! Oh my….images looks so amazing. It’s so yummy. I’m surely gonna try it out. Loved this recipe. I used mission brand extras thin corn tortillas. I used three whole chicken breasts which took longer than 2 hours to cook. Would advise increasing cooking time or cutting up large chicken breasts. Hi Gina. I made this last night and it was delicious! I served it with warm soft tacos and I made your husband’s guacamole recipe. I’m wondering if I could double the chicken and bean mixture to serve more people. I’m new to the slow cooker and am wondering how doubling would effect the cooking time. Thanks! How did the calories get calculated… I've added it up myself based on the numbers/portions provided and just adding the chicken, beans, avocado, tacos, its way more than 313. It's healthy ingredients, but its still about 500 cals as avocado is relatively high in calories, as are tacos and beans. I could only get this down to 300 by removing some/all tacos. Hello, made this last night. AMAZING!!! Could you please give me the nutritional info without the taco shells? Thank you!! how much of the chicken mixture is a serving? cup wise.. Absolutely delicious, Gina! Another great recipe! Thanks for sharing. Can we replace black beans with Pinto? Made these tonight. Will be making these often. Delicious!!! Does anyone know what a cup of chicken and mixture WW PPs would be without the taco shells? 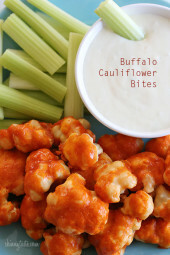 We loved these with your zesty avocado cilantro buttermilk dressing! Soooo good! Thank you!! How much would a cup be? My family has enjoyed many of your recipes! Thank you! Is this correct? Meaning 10 tacos for 8 pts??? Do the nutritional stats include the slaw, shells, etc…? Sorry if this is a duplicate question…if you wanted to cook this on low how long would you leave it in maybe? Do you drain the tomatoes w chilis? Can I make this vegetarian just by adding more beans and no chicken? Can you give the nutrition info without the taco shells? Thanks! 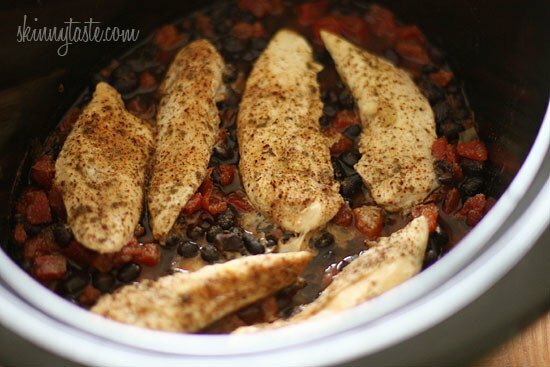 This meal is cooking right now in my crockpot, the house smells heavenly! The slaw is REALLY good with these – you should try it! Just found your site and I love it!! 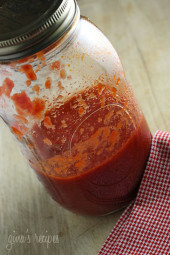 I've made this recipe before but instead of the canned tomatoes with green chiles, I used jarred salsa. Making your version tonight. Can't wait. Looks yummy. My son loves red meat. Do you think this would work well with steak? Has anyone tried it? Steak in a crockpot is a bad idea! Take it from me, who tried that once, LOL. If he likes red meat, I'd use 90/10 ground beef or chuck roast, which is more suited for slow cooking. Hi love your recipes. I just wanted to say that I don't understand how three filled shells can be 8 points plus when 2 taco shells are listed as 5 points. Can anyone clarify? Gina – have you learned the trick where you shred your chicken in the stand mixer? I pull out the cooked chicken, throw it in the mixer with the paddle attachment and it shreds perfectly! Give it a try and see how it works for you. How many points would it be if you just ate the chicken over the slaw and left out the taco shells? Is the Calorie count on this recipe correct? I would have thought that three taco shells alone would have been close to 300 Calories. Love the recipe! 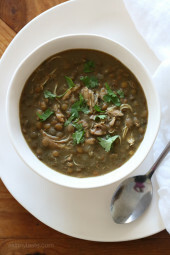 my husband tried this one ( note: he is a major fan of slow cooking meals!! !lol ) We got excellent result! I definitely recommends this to everyone 🙂 Thanks for posting this wonderful recipe. OMG, I made this tonight for a girls night. THIS WAS AMAZING. My best friend is very very picky but she LOVED IT. I had some extra and my boyfriend came home and ate one and the first bite he was like "OMG this is good" and then my other friend passes by and he finished whatever was left over in the pot. I wish I made MORE. THANK YOU SO MUCH. AMAZING!